Even if I weren't a mad gardener and backyard farmer, projects like FieldCoin would still take my interest. Food production is the most important industry on the planet, yet farmers are paid like it is the least important and get next-to-nothing for their produce. Big multi-national agri-business companies and 'fast food' grocery chains monopolize food production, forcing farmers into less-than-fair contracts for their work. Can you imagine, farming the land year after year, getting up before the sun day after day and facing the uncertainty of crop failures due to poor rain, etc... To then have to worry about getting a decent price of your labour if your an independent farmer? Holy cow. We live in a world that has it's values all screwed up. Farming, which provides a necessity of life, is just not valued. When it should be. So when I come across crypto startups aimed at the farming / food production industry, I take notice. Because if there was ever an industry that need to be 'disrupted by the blockchain', it's farming and fresh produce. Talk about an industry that needs some love. And money injected into it. While the computer gaming industry or sports betting sectors have no problem finding funding, food production is viewed as some kind of 'blind leper on the streets of Calcutta'. No one wants to touch it despite the fact that farming solves a real pain point - i.e. global starvation - whereas computer games and sports betting only solve 1st world boredom issues. 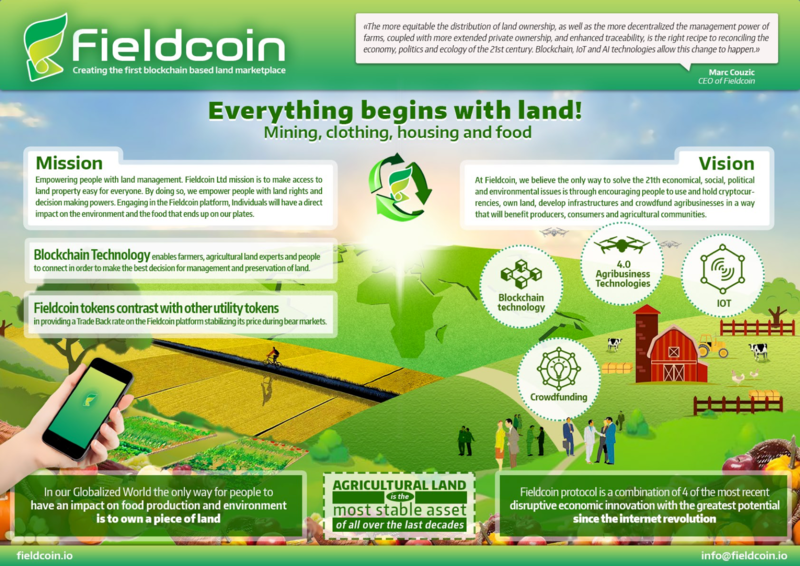 FieldCoin is a blockchain startup that is entering the farming sector to help clean up a great big mess. The idea of a person like me being able to financially support and invest in some farm on the other side of the planet is intriguing. Not from the perspective of receiving dividends on my investment, but from the perspective that I can chip in to pay some farmer to grow their crops and they don't have to beg some multi-national to buy their crop. Providing financial support before the growing season would take an immense amount of pressure from a farmer, who is already battling the forces of nature, let alone market forces to earn a living. Given the fact that the food they produce, for an ever growing planetary population is important, a crypto project that is creating a platform to do so has my interest. FieldCoin interestingly will be allocating a fair percentage of it's Q1 2019 ICO to buying land. Actual physical land, which is an interesting move and a smart investment strategy for a new company. 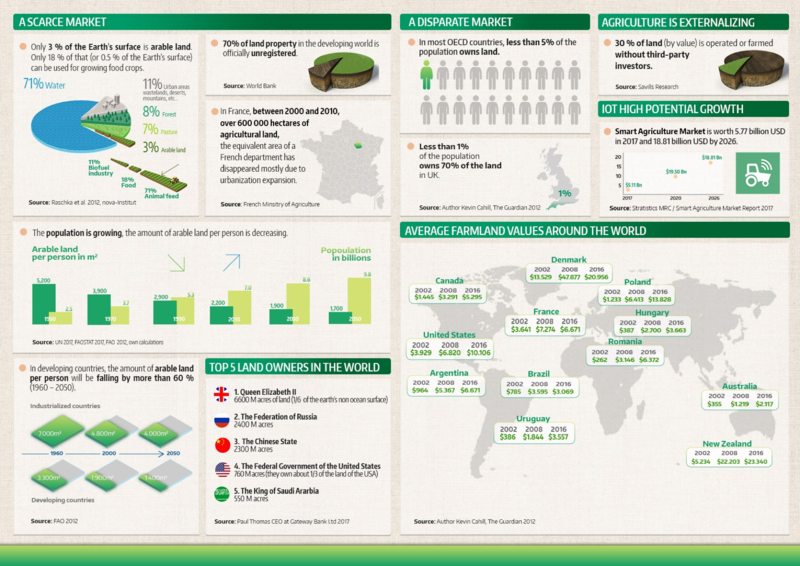 The PitchDeck for FieldCoin is worth looking through as it presents all kinds of facts and figures about global farming. Not to mention it is the prettiest PitchDeck I have ever seen. Without resorting to puns, it will be interesting to watch the growth of this project. Farming and food production is a sport of mine and it will be interesting to see how FieldCoin progresses and combats some of the challenges of farming. I've bookmarked this project and will return to it again at a later date to see how it does. For now, check it out for yourself. The ICO has ( wisely ) been scheduled for Q1, 2019 which is probably when the crypto market will have bottomed and potentially be turning green again after the bear market. If you support natural medicine and an independent research project that began in 1997, then steem me. The creds I get will help me provide a solid body of information that future generations can build upon. DISCLAIMER: This article and all information on this channel & all content is offered purely for educational & entertainment purposes. Always do your own research when investing money and seek the help of a registered financial advisor.